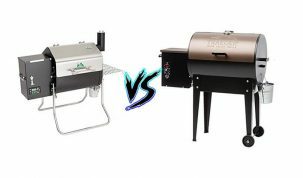 If you’ve read around on King of the Coals you’ll realize that we are big fans of pizza ovens. We love the ability to cook amazing, artisan pizza in a couple of minutes using a real wood fire. 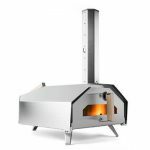 So, when we heard about a pizza oven that can cook just as good pizzas using a gas burner and an automatically rotating plate, we were intrigued. The Blackstone pizza oven does just this at a price point much lower than some of the wood burning pizza ovens available today. We’ll take you through everything you need to know about the Blackstone oven and tell you whether we think it’s worth your money. 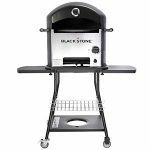 The first thing you notice when you look at the Blackstone Pizza Oven is that it is quite similar looking to a standard patio grill. 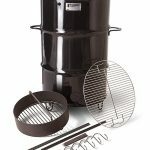 It has quite tall legs with wheels for some portability, two side shelves, a bottom shelf for the gas bottle and a main cooking area with a thermometer. So far things seem fairly standard. Where the Blackstone gets really interesting is what’s under the hood of the main cooking area. The stand-out feature is the 16 inch rotating pizza tray. This works through a small motor that is powered by 2 D batteries or a direct connection to the mains. It slowly rotates the pizza tray, and pizza, to ensure very even cooking. We’ve never seen anything like this on such a cheap commercial product before and can safely say that it works very well. It helps take away any worry of over cooking one side of your pizza. There is even a second pizza stone on the roof of the oven to reflect heat back down onto the top of the pizza to ensure the top is cooked as well as the bottom. The Blackstone oven is powered by a 60,000 BTU burner. 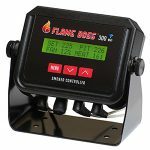 This heats up the oven in about 10 – 15 minutes and can reach a maximum temperature of around 900°F (480°C). It can be lit by the push button igniter. This uses a AA battery (which is not included) and is one of our least favorite parts of the Blackstone. It has a dial so you can adjust the temperature inside. 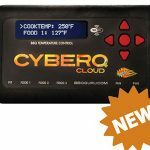 This is a great feature for people looking for a simple and easy way to manage their pizza cooking. We recently reviewed the Uuni 3 Pellet Pizza Oven, and one of the major problems with that was the inability to easily control the temperatures. 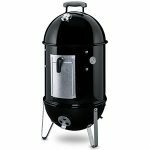 The main unit of the Blackstone is made very well. 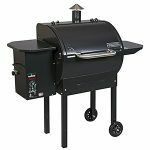 It has a nice stainless steel front plate and the insides are made of a mixture of high quality materials that manage to contain the heat from the burner very well. A removable front door/lid would have been nice, but it does maintain temperatures consistently. There are a couple of issues people are reporting though. The first one being trouble with the rotating tray system. Since it’s a moving part there’s likely to be misalignment issues and general breakages. The other main problem is the push button igniter. This just stopped working for us, we changed the battery, took it apart, but in the end, we just use a normal lighter. Not a problem but a little disappointing. Assembly is another topic that has frustrated some people. There have been reports of parts simply not fitting properly or parts missing. Whilst others say assembly was easy. We didn’t actually have to personally assemble the one that we used, but were told that assembly could definitely be made easier. The motor is quite easy to set up and get working. 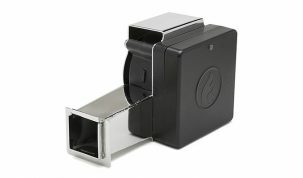 You simply insert the metal chuck and slide the motor into the mounting bracket. This should line up with the rest of the rotisserie system and when turned on will start rotating the pizza stone. When you’ve fully assembled the Blackstone oven, it becomes a joy to use. You simply make sure everything is plugged in, start the motor, then the burner and after 10 minutes you’re ready to go. Loading and unloading the pizzas was easy, even if the tray was spinning. There’s just enough room for you to comfortably slide your pizza all the way in. The rotating tray makes the Blackstone one of the easiest pizza ovens to use. You simply don’t have to worry about checking on the pizza throughout the cook and can let the oven do its thing. Then after two minutes take it back out. Having a couple of shelves and a rack helps with the logistics of moving multiple pizzas around and means it’s a whole lot easier to cook several in quick succession. The rotating tray is our favorite feature. When it works, the tray makes things so much easier and more interesting. I could watch pizzas slowly spin and cook all day. It has enough room for 16 inch pizzas. You won’t find another pizza oven any where near this price range that can cook pizzas of that size. The speed and efficiency of how this cooks pizzas is brilliant. Having two pizza stones ensure maximum heat retention and results in very evenly cooked pizzas every time. We easily got our pizzas to cook within 90 seconds when we really ramped up the heat. 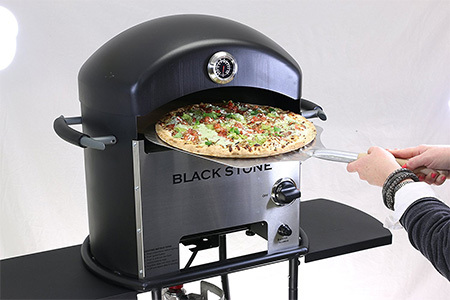 Due to the quick cooking time, easy loading and unloading of pizzas and no need to turn them during cooking, the Blackstone is perfect if you need to cook lots of pizzas in a short time. You could easily get 20-30 quality pizzas out in an hour. We love that you can get all of this at around the $300 price point. You’ll struggle to find some of the more unique features on pizza ovens that cost four times that much! The build quality could be better. If Blackstone could fix the small potential problems with the rotating tray and the igniter then this would be almost perfect. The height of the cooking chamber allows only some other foods to be cooked on it. 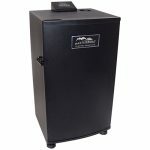 If you’re looking for a great all round outdoor oven then this isn’t it due to the limited range of other foods it can manage. Overall, the Blackstone Outdoor Pizza Oven does a lot of things right. We love that they’ve tried innovating with the rotating tray and think they’ve mostly succeeded. The design of the cooking chamber leads to some of the easiest pizzas to make and best ones we’ve tasted. 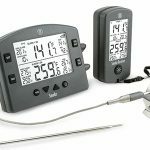 It has a bunch of nice little extras, such as shelves and adjustable temperatures that make cooking on it so much more convenient that with a traditional wood fired oven. And you get all of this at a very low price that simply isn’t matched elsewhere. But there are some problems. 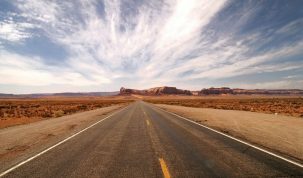 The construction issues and lacking quality might be enough to put you off. If Blackstone can update this model with a few fixes then this would be an absolute no-brainer. But as it stands we still think that it’s worth a purchase as the pros majorly outweigh the cons. 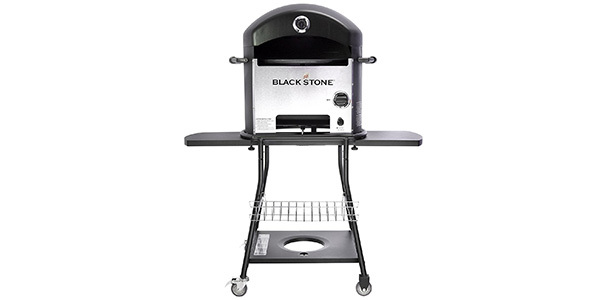 Check the latest price of the Blackstone Pizza Oven. Make sure the rotating pizza tray motor is turned on before you ignite the oven. This will ensure that the pizza stone will heat evenly during the warm up period. Whilst it’s nice to have a built in thermometer, they tend to not be very accurate. 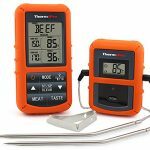 We’d recommend you have a look at our list of the best infrared thermometers which will give you a much more accurate reading of the temperature in your pizza oven. 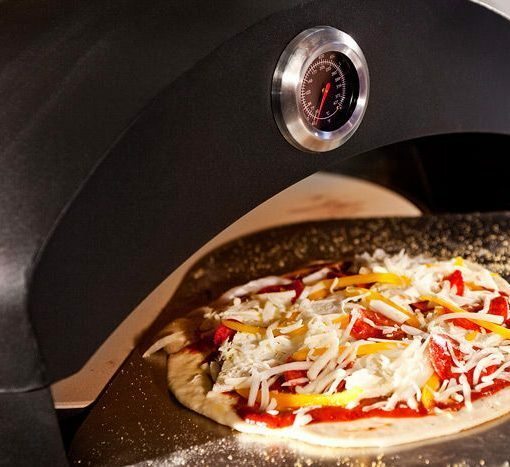 We’ve also got a list of the best pizza oven accessories, that include pizza peels and cutters. Use a cover to protect it from the rain. 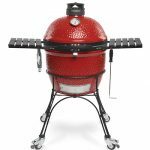 For a quick guide to some of the best pizza oven recipes for the Blackstone Pizza Oven, check out Blackstone’s own recipes page.